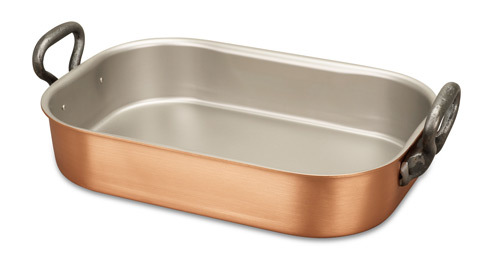 We know you'll love this	35 x 23cm copper roasting pan	as much as we do. Sunday lunch just got better Very pleased with this. Since buying it 3 weeks ago I have tried roast chicken, pork and beef in roasting pan. I love the way everything in the bottom of pans stirs into gravy afterwards which simmers away perfectly on the hob. Ideal When I read about roasting pans, advice always includes thick flat base. 843 customers found this review helpful. Did you? Yes, I did! I just love this roasting pan! This is a really solid pan and will not distort with the heat in an oven like cheap pressed pans tend to do. Roast Away! Perfect for the XMas roast! 833 customers found this review helpful. Did you? Yes, I did! Cooking lasagna in the roasting pan My wife is going to cook lasagna in this roasting pan and is going to look beautiful when is served on the table. Superb! Wow! I bought this superb Roasting Pan together with the 28cm Saute Pan as a Christmas present for my husband. If our saucepans are anything to go by, they will be an absolute dream to cook with! Quality Pan A heavy roasting pan, superbly made and very well finished. From roasting the meat in the oven to finishing the gravy on the hob the heat is transferred evenly. Five stars! 791 customers found this review helpful. Did you? Yes, I did! In a class of its own..... Wow!! this piece is superb!!! The Mother of all roasting pans I have used this for roasting as well as an impromptu fry-up vessel when more people wanted breakfast than I bargained for. I am sure if QPR turned up on my doorstep after a training session I could rustle up a large stew for them as it holds tons. 751 customers found this review helpful. Did you? Yes, I did! Fabulous Heavy Duty Roaster This purchase was my first venture into Falk cookware and results from this roasting pan have been brilliant, each Sunday for winning roast dinners! Also, the roasting pan, has been to date a breeze to clean afterwards perhaps because of the satin finish on the inside? The cast iron handles are also very comfortable to use and manoeuvre in and out of the oven. The size of the pan is useful though could be even larger to accommodate just a few extra roast potatoes! 740 customers found this review helpful. Did you? Yes, I did! The most versatile pan I have Just love my Copper Roasting Pan, not only is it great for standard roasting such as joints, it is versatile enough for lasagne, pies etc. and combined with the lid is one of the most used pans that I own. 723 customers found this review helpful. Did you? Yes, I did! Well made Well made - does the job well. Excellent Like other Falk products, this is a versatile piece, great for cooking large quantities of lasagne or other bakes for a party; it looks good for serving them, too. 713 customers found this review helpful. Did you? Yes, I did! Great Copper Roasting Pan! The lid on this pan is greatly useful, roasted vegetables with the lid on, and chicken without the lid, they both tasted amazing compared to using regular stainless steel pans. Wish a wider one could be manufactured. 689 customers found this review helpful. Did you? Yes, I did! 35cm roasting pan It makes Sunday roast a must.A little bit on the heavy side once you've got a big joint in it.The best part of it, is from the oven straight to the table..as it is such a lovely looking piece of cookware. Fantastic Roaster I am really impressed with the heat distribution with the roaster on a gas hob. I browned the meat for a hot pot successfully in the roasting pan, which also saved on washing up. Great to have a lid too, for the cooking and reheating of dishes. Love being able to put the roasting pan straight from the oven to the table.